The stalemate over Kashmir: How to resolve Asia’s oldest conflict? On July 9, the Indian army killed a 23-year-old popular Kashmiri militant, Burhan Wani. Since then, the region is under strict curfew. Due to the authority’s iron-fisted response to dissent, over seventy people are dead, more than eight thousand civilians are injured and about six hundred are blinded due to the use of pellet-guns. The right-wing Prime Minister Narendra Modi and his Bharatiya Janata Party (BJP) remain unwilling to treat Kashmir as an international political issue and continue to disengage Kashmir’s demand for self-determination. 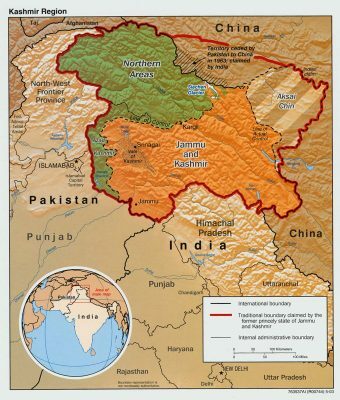 The former state of Jammu and Kashmir, ruled by the British-installed Dogra monarchy, is now divided between India, Pakistan, and China. The monarchy, through different periods, had seen several upheavals from its subjects. These Kashmiri uprising(s) paralleled the subcontinent’s anti-colonial struggle against the British rule. The British exit from the region in 1947 led to the partition of the Indian subcontinent, birthing two new countries—India and Pakistan. This left the Dogra king of Kashmir, Hari Singh, with an option to join either of the newly formed modern nations. Singh, presiding over a Muslim majority, remained undecided. The undecidedness of the Kashmiri monarch is attributed to the complex political nature of Kashmiri society. The uprising in Poonch region in 1947 that sought to join Kashmir with Pakistan proved that the national will of Kashmiris could not be galvanized for a merger with either one of the nations. In the Kashmir valley, the popular leader Sheikh Abdullah propounded politics of Kashmiri nationalism with strong opposition to the idea of partition. To quash the Poonch rebellion and to deter the tribesmen entering from the north in support of the rebels, fearing that the rebellion would break the country, the monarch sought the Indian military intervention. The military help came with a condition to accede to India.